“The gregarious Malaysian businessman nicknamed “Fat Leonard” is well known by U.S. Navy commanders in the Pacific. But prosecutors in court papers say Leonard Francis worked his connections to obtain military secrets by arranging prostitutes, Lady Gaga tickets and other bribes for a U.S. commander, in a scandal reverberating across the Navy. The accusations unfolding in a federal court case signal serious national security breaches and corruption, with the threat that more people, including those of higher ranks, could be swept up as the investigation continues. A hearing Nov. 8 could set a trial date. Navy commander Michael Vannak Khem Misiewicz passed confidential information on ship routes to Francis’ Singapore-based company, Glenn Defense Marine Asia Ltd., or GDMA, according to the court documents. So far, authorities have arrested Misiewicz; Francis; his company’s general manager of global government contracts, Alex Wisidagama; and a senior Navy investigator, John Beliveau II. Beliveau is accused of keeping Francis updated on the investigation and advising him on how to respond in exchange for luxury trips, prostitution services, and more. All have pleaded not guilty. The defendants face up to five years in prison if convicted of conspiracy to commit bribery. Defense attorneys declined to comment. Senior Navy officials said they believe that more people would likely be implicated in the scheme, but it’s too early to tell how many or how high this will go in the naval ranks. Other unnamed Navy personnel are mentioned in court documents as getting gifts from Francis. Francis is legendary in military circles in that part of the world, said McKnight, who does not know him personally. He is known for extravagance. His bungalow in an upscale Singapore neighborhood drew spectators since 2007 to its lavish, outdoor Christmas decorations, which The Straits Times newspaper described as rivaling the island city-state’s main shopping street. That same year, Misiewicz caught the world’s attention when he made an emotional return as a U.S. 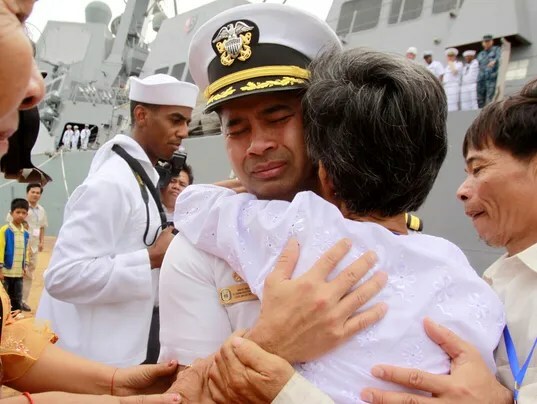 Naval commander to his native Cambodia, where he had been rescued as a child from the violence of the Khmer Rouge and adopted by an American woman. His homecoming was widely covered by international media. Francis’ company bilked the Navy out of $10 million in just one year in Thailand alone, U.S. Attorney Laura Duffy said.